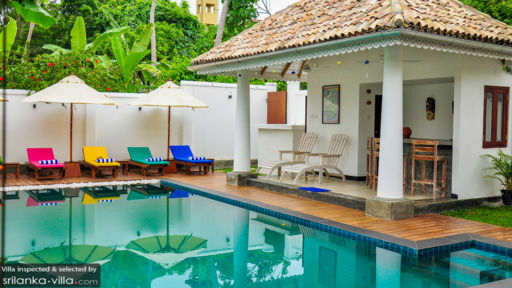 The decoration and attention to detail, the facilities, the staff, the food, the location (5 mins walk from the beach, 5 mins tuk-tuk ride to Weligama town). Just wow. The review about feeling like a millionaire sums it up. Relaxing atmosphere, so close to nature (monkeys and iguanas living next door) tiny fly eating geckos and regular bird and chipmonk visitors. The excursions were fab, releasing 2 day old turtles into the sea, seeing whales and dolphins and the elephant safari, out of this world. The food amazing!! Recommend the tuna (to die for) and red snapper. They even catered for our fussy children. The staff were so conscious and helpful. Nothing was too much trouble. The only negative... going home. I wish it was the hotel California instead. Lovely villa the photos don’t do it justice. The best thing though is the staff nothing is too much trouble and they are all so friendly. The area is lovely and we all enjoyed the local restaurants. Whale watching is a must as is the turtle farm. Supper on the beach at Mirissa is unbeatable. Our word for the week.... amazing! 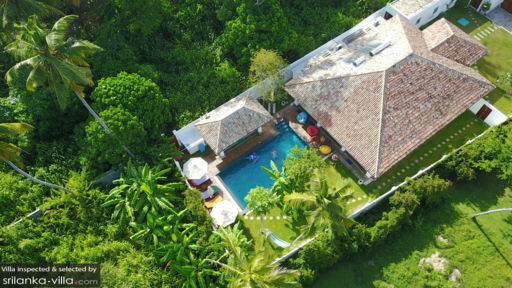 The villa is located in the outskirts of Weligama in the heart of the community enabling the opportunity to engage with the locals who are extremely friendly. On the other hand once inside the villa the atmosphere is one of tranquility with the feeling of complete isolation from the outside world. The villa is within easy walking of the local beach and restaurants. Alternatively, Weligama and Merrisa beaches can be accessed by tuk tuk in a few minutes very cheaply. The staff of four led by Chiqi the on sight manager are extremely efficient and helpful. Chiqi was most useful in organising trips and making recommendations for eating out etc. We saw a large pod of blue whales one outing. A trip to Galle about 25 miles away is also well worthwhile and we recommend travel by train for a mere 15p one way! We shared the villa with our two daughters and their families who joined us for a week each. Our grand children ranging between the ages of 23 and 17 could not believe their luck! Shihinaya, or Dreams in the local language was a real find and we are very envious of those who follow us.It really does mean that your dreams can come true! We spent 11 nights in paradise. The villa is perfect for families or groups. The 4 bedrooms make it very convenient. The open kitchen area and pool is where we spent several hours, perfect. The house staff takes good care of you and can arrange whatever asked. Location is really great if you want a local and peaceful experience. The villa is placed with local beaches and restaurants in walking distance. Absolutely a place to recommend, we had amazing time. We had a wonderful family holiday at Sihinaya Villa over Christmas 2017. 2 weeks of relaxation and fun. The house is comfortable and welcoming, with it's colourful & locally-sourced furnishings and decoration. As soon as we walked in the gate, we felt at home and relaxed... it's like a little oasis. The staff were very discrete, and ever-patient and helpful (no matter how minor our requests). Our Christmas meal was a wonderful affair with flaming torches around the garden and thoughtful little gifts for all of us... We were made to feel very special and were very spoilt by Chiqui and his excellent team. We loved the location of the property, which is down a quiet road (a short walk to a lovely beach with a great surf spot!) and yet close enough for easy trips into Weligama. It was easy to just chill out locally, but also (with Chiqui's help procuring tuktuks or taxis) no effort at all popping out to visit beautiful Galle or places of cultural interest. 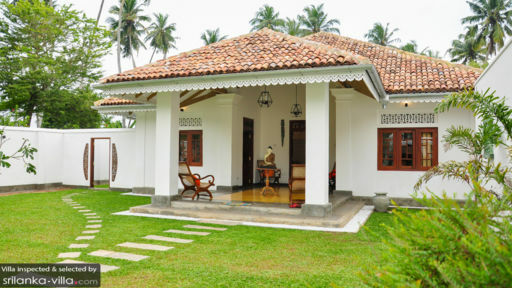 We will definitely be keeping Sihinaya Villa on our favourites list for future visits to Sri Lanka!! We spend 8 relaxing nights at the Sihinaya Villa. The staff where so helpful. The food amazing ,breakfast (wow) Great location. A Beautiful home. We will be coming back. Spent the first week of a 3 week tour of SR with the family (3 kids aged 16, 14 & 12). From the moment we entered through the big gates to the time we said our sad goodbyes to the lovely staff we absolutely loved it here. The villa is really well laid out and thought through - congratulations to the owner! We've never had staff before, but it's certainly the way to go :-) especially when they are as nice/kind/thoughtful as the team here. A big thank you for looking after us so well! Copyright © 2019 SriLanka-Villa.com. Bel ons in Singapore +65 6871 8993 of Australië 1300 014 384.